The kitchener stitch, in knitting, is a way to graft two sets of live stitches together. I don’t knit very often any more, but I really like the name. And, this new tangle is based on the design that’s on my kitchen floor. So… kitchener, get it? Ha! I thought you would. I took a long look at the tangles over at tanglepatterns.com, and could only find one, click clack, by Jane Monk, that has a similar mode of creation. I thought that kitchener was enough of a departure to be its own tangle. If I have inadvertently copied someone else’s tangle or tangle name too closely, please let me know. There are so many out there, it’s hard to keep track, even with the amazing library that is tanglepatterns.com. There! Now everyone can recreate my kitchen floor whenever they like. Here are a couple of tangellation ideas. In addition to kitchener, I also used phicops, sand swirl, flux with some tipple, flukes, and knase. This tile is made with knase, knightsbridge, poke-leaf, quandary, and sláinte. Oh, and kitchener, of course. If you use kitchener in a tile, I would love to see it. Put your link in a comment on this post. 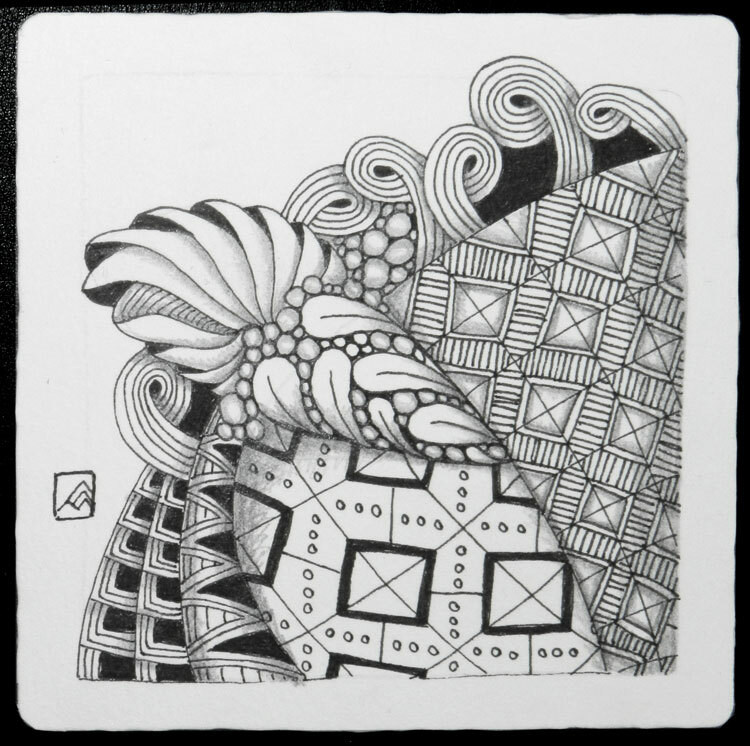 This entry was posted in drawing, zentangle® and tagged kitchener tangle, new tangle, tangle based on kitchen floor by mary sargeant. Bookmark the permalink. Beautiful things. The terminology used is completely foreign to me, but I do like the outcome. Thank you Nancy! As for terminology, a tangle is a repetitive pattern that’s drawn with ink. You don’t have to, but lots of people draw on a three-and-a-half-inch square, thick paper that we refer to as a tile. 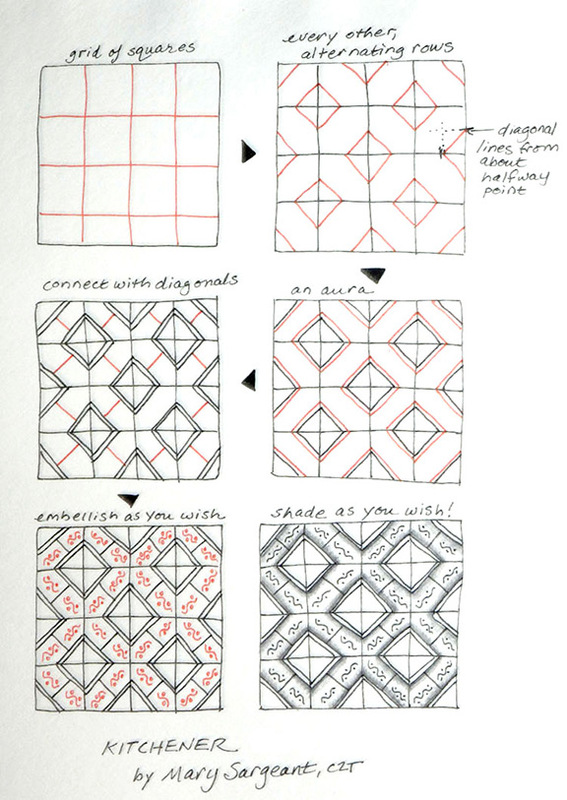 Each tangle that we draw on a tile has a name, given it by its author (I italicize them on my blog). In naming a tangle, the point is to not be too literal about how that pattern is drawn. For instance, I could have called kitchener “diagonal tile pattern on a grid,” which would not only be overly descriptive, it might be so prescriptive that it would rule out any new, creative interpretations (tangellations) by someone else. I hope this brief explanation helps. 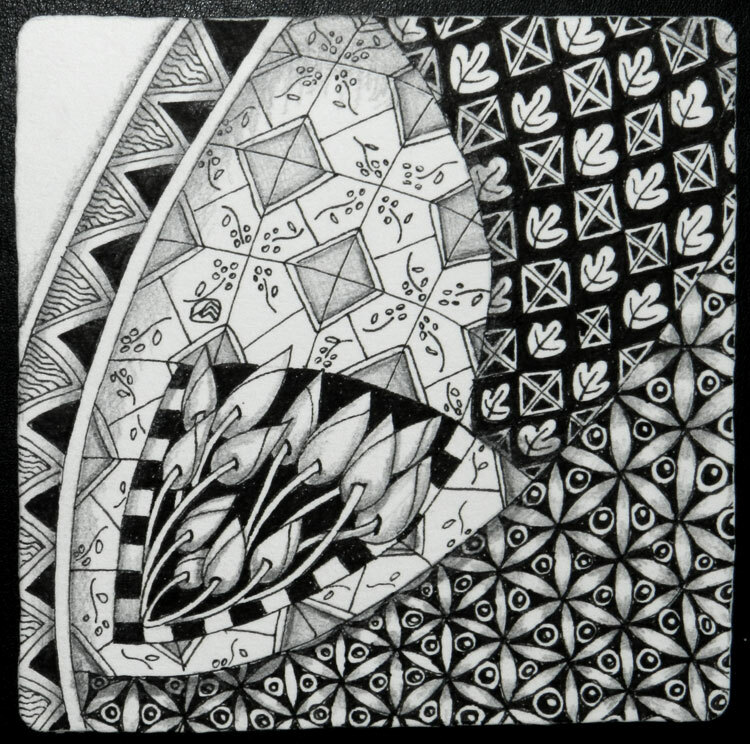 Definitely take a look at zentangle.com to get a feel for the drawings and the language associated with them. At first, it’s like stepping into an unfamiliar world. Before you know it, you’re an integral part. Kinda like… life! I shall do that! Thank you for the info! How are you doing these days? I love the dimensional look of your work! Thanks for sharing 🙂 I have been an artist for most of my life (as a hobby) and I’m fairly new to tangling, I am having a great time learning. Thank you! I picked up Zentangle last summer and haven’t been able to put it down. It’s a wonderful, ongoing learning experience. I like it – it will be a good filler or background for heavier tangles. Thanks! I really like your signature- how did you develop it? Thanks! It’s an M with three inverted V shapes, representing sergeants’ stripes, over one of the M points. M for Mary, and the chevron for Sargeant. That is a great tangle and I love all the alternate patterns, so good. Thank you for sharing this tangle! After reading the other comments, I had to admit that the various names for tangles are like another language. You create beautifully striking tiles! Thank you Barbara. I think Maria Thomas and Rick Roberts were really onto something when they decided to start naming the tangles. The names are another way to make the whole process accessible and fun. Once you get started, you find yourself immersed in it… and you get to attach your own sense of meaning to them. Kitchener is one of the patterns I love at first sight!! It will be great fun to explore the many, many possibilities. Thank you for sharing the steps and your wonderful tiles, Mary! Thank you, and you’re welcome. I hope you’ll send a link to show how you tangled kitchener. You will love going to a class. I knew the stitch was named for someone, but I didn’t know who. Thanks for the history! Nice simple start with lots of possibilities. Love the tiles you did too! Thank you Margaret! Glad you stopped by… I hope to see your kitchener interpretations some day. You always take tangles in fun, new directions. I love these images! How are your folks? Merry Christmas! Thanks Jane. I’m heading to see my folks on Saturday… they’re much as usual. Merry Christmas to you, too. Love your interpretation of Kitchener!